My sister and I turned onto the short dead-end road and parked the car. “It’s over there,” she said pointing to a small overgrown patch of land. I opened the door amazed my search for my Caple ancestry had brought me to this tiny family cemetery in Carroll County, Maryland. I last left the story in search Caple ancestry with the discoveries that my great grandfather, Samuel H. Caple’s, father was Jacob and in turn his father was, Samuel Caple Junior of Richland County, Ohio. I had learned both men had roots in Maryland. Now I was in search of Samuel Junior’s parents. Over the next few weeks, I spent my spare time, pouring over the census records of Maryland for Caple and Caples. I concluded Samuel Caple of Baltimore County, Maryland (now Carroll County) was my most likely candidate. Could he be the same Samuel Caple I’d found in references to the Revolutionary War? Back when I had first started my Caple quest a cousin, also researching the family, mentioned she had corresponded, via the internet, with a woman who was a descendant of this Samuel. At the time we knew nothing to connect us, but now we did. I got her phone number and called. She lived in Maryland and knew of the Samuel I spoke. She was a descendant through one of his daughters. One named Samuel born in 1783 (the right time frame to be my Samuel). The other two, William, born in 1784 and Jacob born. in 1790. Her family lore stated, Samuel Caple Junior had moved to Ohio after a disagreement with his brother William over slavery, and was never heard from again. A story that sounded much like the story my grandfather had told. This had to be the right family. She also told me Samuel Senior had been buried in the family cemetery which still existed on a portion of his land. And there were family stories that said Mary Cole might be a Native American or maybe it was Samuel Senior’s mother who was the Native American. Then again, she said, they might just be stories. Earlier researchers had assumed Samuel Caple Senior had previously been married and the boys were from this marriage. But a a new document had been found. One showing Samuel and his wife, Mary Cole, had appeared in Court on Nov. 9, 1809 and swore the three boys were Samuel’s and that he wished for them to carry the Caple name and have the rights to inheritance. The record helped establish my Samuel belonged to this group but it also spelled the beginning of my biggest genealogical puzzle. Why had Samuel and Mary Cole waited 10 years, after the birth of their first son, to marry? Who were Samuel and Mary’s parents and was Native American ancestry part of their story? This entry was posted in Uncategorized and tagged Baltimore County, Caple, Carroll County, family history, genealogy, Jacob Caple, Mary Cole, Maryland on November 8, 2016 by kwriter13. I held the will for Samuel Caples in my hand and struggled to read the writing. The will was recorded before a probate judge on May 17, 1869. I give and bequeath to my wife in lieu of her dower 800 dollars. I device and bequeath to my son Jacob Caples, one dollar, my son Nimrod Caples, one dollar, my son Samuel Caples, 800 dollars, my son Andrew Caples, 800 dollars, my son Robert Caples, 800 dollars, to my daughter Rebecca married to David Grimes, 400 dollars, to my daughter Elizabeth married to Joseph Evans, 400 dollars, to my daughter Ruth married to Abraham Linnard, 400 dollars, to Keisa married to Henry Crabbs, 400 dollars, to Amy Church, James Church and Ann Church one dollar each, Emeline Caples, daughter of William Caples one dollar. I was elated. I had found Jacob’s father. It wasn’t just that his name was listed as a son but also the mention of a son named Nimrod. Nimrod was the name my aunt had found while researching the family in Monroe, Iowa. The same town where Jacob had lived. The name Rebecca Grimes was also listed which matched what Daisy Lee Grimes had said in her query in that old book in the used book store. That Jacob and Nimrod had only received one dollar in inheritance suggest they might have had a falling out with their father, however I think it is more likely they had already received their share, perhaps in the sale of the land Jacob had handled for Samuel. And there was another Samuel mentioned. No wonder my great-grandfather insisted on being called Samuel Hugh. He had an uncle and grandfather sharing his name. The S on the end of Caple didn’t bother me. I’d learned in the 1800’s people weren’t as concerned about how things were spelled. Even within the land documents Jacob had sold his name appeared with and without the S in the same document. Samuel Hugh’s pension files had him listed both as Caple and Caples. Now it was time for me to see if this Ohio, Samuel Caple was connected to the revolutionary war Samuel Caple, from Maryland. Time to start looking at the early census records in Maryland and connect to those who had more information about the Maryland Caple family via the internet. This entry was posted in Uncategorized and tagged Caple, Caples, family history, genealogy, Iowa, Jacob Caple, Ohio, Rebecca Caple Grimes, Samuel Caple, Samuel Hugh Caple on March 23, 2016 by kwriter13. It’s been a while since I wrote about the discoveries I made with my Caple family history, so I am including a brief synopsis of what I have written thus far before moving onto the next chapter. 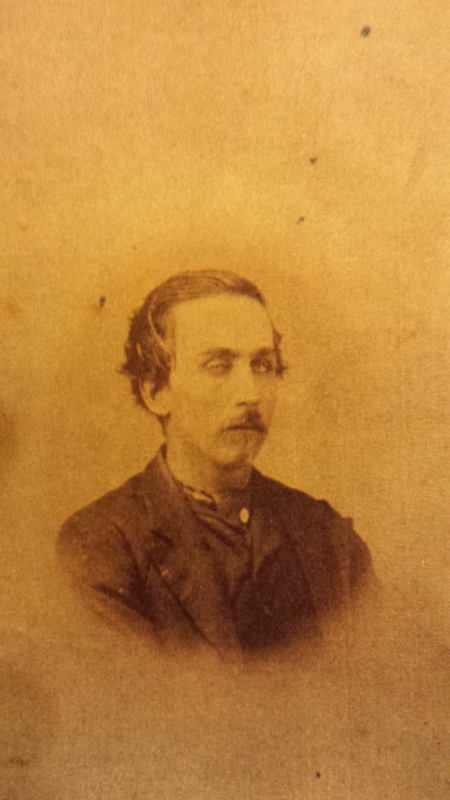 According to my Grandfather, his father Samuel Hugh Caple and had fought in the Civil War. From Samuel’s Civil War pension papers I learned he had been born in Ohio, his parents were Jacob and Sarah Geary Caple. While in Monroe my aunt had copied some deed we assumed were for Samuel Hugh Caple. But on closer inspection I noticed the the facts didn’t jibe. The deeds seemed to be for different Samuel, one who lived in Richland county, Ohio. —————————————————————————————————————————–Family known so far: Grandfather-William Roy Caple b. 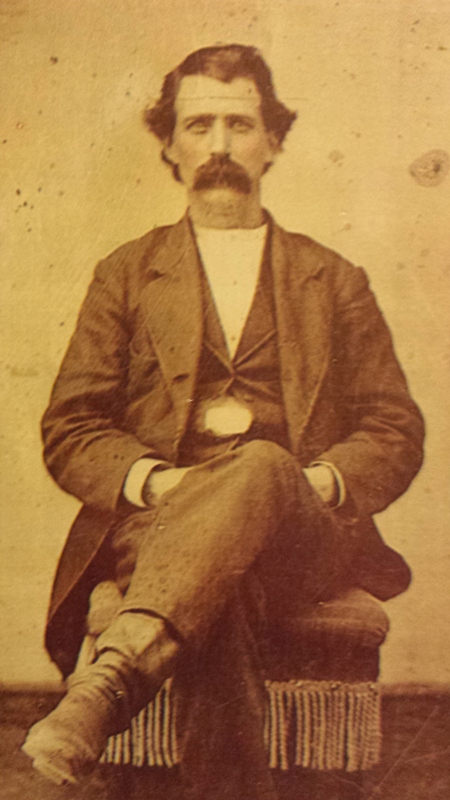 1885 -1971, Great Grandfather- Samuel Hugh Caple 1845-1920, GG Grandfather Jacob Caple 1816- after 1872? WHO WAS THIS SAMUEL CAPLE? After discovering the possibilty another Samuel Caple might be connected to the family I paid a visit to the local “Family History Library” run by the LDS church. There I was met by a friendly volunteer who suggested I start my search with the IGI index. I typed in Samuel Hugh Caple. Up popped his name along with his parent’s Jacob and Sarah Garey Caple, his first wife Polly Sumpter and their children Milo and Minnie. Information I already had. 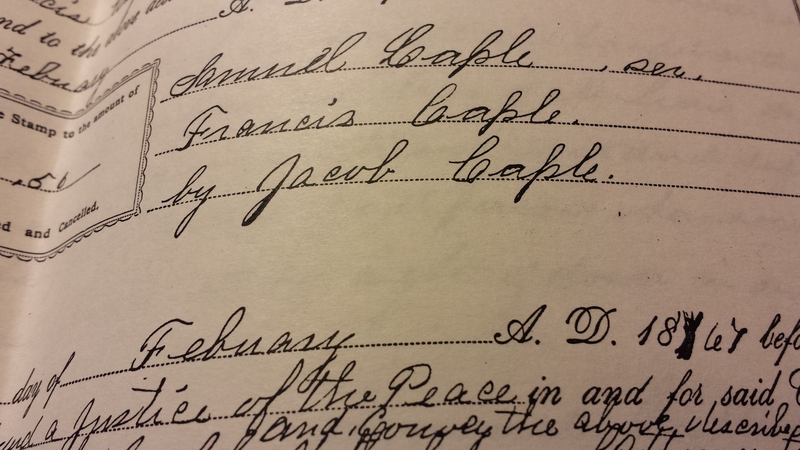 Next the volunteer guided me to look in the 1860 census for a Jacob Caple in Iowa. Armed with a page number from the census index book, I soon was whirling through microfilm until I came listing I wanted. Ida -age 2 born in Iowa. With the H. added to Samuel’s name and his age I was sure I had the right family. Ida’s birth in Iowa placed the family’s move to the state to be around 1857. So far everything matched the info my aunt and Samuel’s pension file gave. It was time to look in Ohio. Liberty township, Knox county, Ohio -1850. Mary Etta, age 1, born in Ohio. They had to be my family. But the mystery of the Samuel Caple on the Iowa deeds still remained. If Jacob had POA, there had to be a connection. Next I searched for a marriage record for Jacob and Sarah in the microfilm copies the library had on file. I found them but the record gave no parents names. Next she suggested I look for a Samuel Caple in the 1850 census of Richland county. I was thrilled when I found one and he had both a wife named Francis and was old enough to be Jacob’s father. There was that name Samuel again. Now I had three of them. I recalled my grandfather saying his Dad always insisted he was Samuel Hugh Caple not just Samuel Caple. I wondered, was it because their was more than one Samuel in his family tree? Next I checked for this Samuel of Richland county in the 1860 census. Would he still be alive? James age 16. born in Ohio. Okay, if he he was still alive in 1860 maybe he was still alive in 1867 , too. He was certainly old enough to be Jacob’s parent but his wife wasn’t. Did Samuel perhaps remarry after Jacob’s mother died? I could look for an earlier census for this Samuel Caple and in fact I did find him but before 1850 no spouse or children were listed by name. The 1840 census would not help me prove or disprove this Samuel was Jacob’s father. For that I will need a will or some other document that might show the names of his children. That night I composed and sent a letter to Richland county clerk’s office asking if they might have will on file for this Samuel. In the meantime I decided to follow my aunt’s suggestion and call a cousin, also named Samuel, who lived locally. I had a lovely chat with his wife. Yes, they too,had been trying to discover the origination of the family. Unfortunately she had no new information to add. But she did have a computer. Now this was 1993 and the internet was new. On a genealogygroup page someone from a Caple family in Maryland had contacted her. They had compared trees but found no matches. However the Maryland person mentioned a Samuel who was the son of the Revolutionary Samuel I’d found in the library book. According to her, this Samuel had a disagreement with his brother over slavery and had moved north to Ohio. The story seemed similar to the one my grandfather told. The one where the family had been from the south but sold the plantation and moved North over slavery. Could the Samuel on the deeds and in the Richland county, Ohio be the person my grandfather spoke of? And if he was, could he be the same Samuel the person from Maryland spoke of? Hopefully I would have some answers when I heard back from Richland County, Ohio. For now all I could do was wait. This entry was posted in Uncategorized and tagged Caple, family history, Geary, genealogy, Iowa, Jacob Caple, Maryland, Ohio, Samule Hugh Caple on February 21, 2016 by kwriter13. 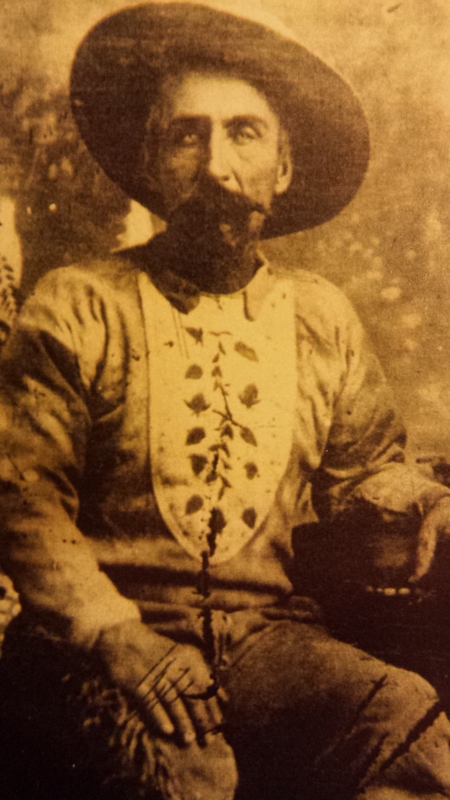 Was this the outfit my great grandfather wore back when he was freighting with Buffalo Bill Cody in Kansas? According to my grandfather, after his dad wore these buckskins for years, he decided they should be cleaned. He hired a Native American woman who said she was experienced in cleaning leather. They were returned shrunken and ruined. This entry was posted in Uncategorized and tagged Buffalo Bill Cody, Caple, family history, geneolgy, Kansas, Samuel Hugh Caple on April 28, 2015 by kwriter13.